Why There's Wood Fences in Mentryville. Published in The Signal, 12-13-2004. Me and My Father and the Post-hole Digger. As a youth I lived on a ranch/oil lease in Southern California, just north of the San Fernando Valley. Seeing that the town was five miles away and I had lots of chores to do, my free time was at a premium. But when the chores of milking and feeding cows, feeding hogs, mucking barns, and other fun ranch stuff was done, I used that small amount of free time well  at least, in my own mind. It turns out that quite often, my father had a different view of how I should "well use" my free time. Which brings up the subject of FENCES. The ranch of my youth has now become a California state park as the site of Mentryville, the oil field boom-ghost town. I was there recently, and the ranger on duty asked me about fences. Seems he had noticed that some fences had a beginning and end, but he couldn't see the purpose of the fence. It just started and stopped. He said the fence ran "real straight with the posts spaced almost exactly eight feet apart." He just couldn't figure out why a fence was where it was. I asked him if the posts were steel or wood, and he replied, "wood." See, there are fences with steel posts that don't run as true and seem to have some logical reason for being. But those straight lines of wood-post fence  "just what were they for?" A great family secret can now be revealed. My father never hit or struck me in any way. He tended to assign me work that reminded me that what I considered time well spent was not how he thought I should use that time. For example, swimming in the water tank was a great time for me, but for him, not allowed. Being late for dinner was another infraction. When these disparities between his and my thoughts as to how I should spend my free time collected to a certain point (known only to my father), he would assign me some small task to correct the error of my ways. Thus, the "meaningless" fences. If you've ever been on the handle end of a post-hole digger, you know how much fun that can be. What with the sand, gravel, clay, rocks and sandstone of the ranch, some post holes would have been better dug by explosives. But that was not the purpose my father had in mind. He would tell me to get four to 10 posts in the back of the pickup truck and the appropriate tools to install them, and off we would go to the soon-to-be fence line. He would lay out the line and mark the spot for the first one. I then had to dig the same number of holes as we had posts on the truck, making sure the holes were in the line he wanted, and measured at eight feet apart. I then had to put the posts in the ground and string the wire. I had best be able to pull the wire tight and touch each post with that wire. (Barbed wire, that is.) The wire had to be straight, and there had better be an equal number of barbs between each post. Steel posts were used only when the fence had a real purpose. So the park ranger found the real reason for the meaningless fence lines. Wood posts, Darryl in trouble. Steel posts, useful fence. As for those wood post fence lines being meaningless, I think not. I learned that building something straight and true was always time better spent. I can list many meanings to those fences. Object lessons abound. But most of all, I learned that fences can keep people and animals separated, and they can also bring a father and son closer to each other. That is what those fences did for me and my father. Oh. I also learned that if you can afford it, have a professional install your fences while you watch. I suggest that a tall glass of sweet tea is the appropriate tool to use while you watch. Sure beats the post-hole digger! 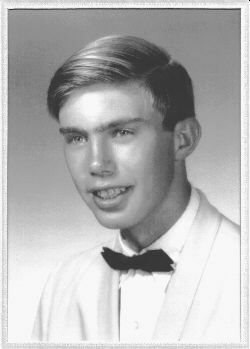 Seen here in his 1968 high school yearbook photo, Darryl Manzer lived in the Pico Canyon oil town of Mentryville (behind today's Stevenson Ranch) from 1960 to 1966. He'll be retiring in January 2005 from his job as an engineering manager at the Norfolk Naval Shipyard in Virginia.